Any conversation about how technology is transforming the world of automobiles is bound to turn into some wild discussion about driverless cars. There’s just no avoiding how obsessed we’ve become with visions of a future where everyone is being whizzed around in some kind of high-tech autonomous vehicle. But of all the innovations from Porsche, one of the most exciting is a feature that continues to raise the thrill factor of being behind the wheel. In fact, that technology, which manages Porsche’s intricate all-wheel-drive system, is heavily credited with helping to make the 911 one of the most coveted sports cars on the planet for 30 years running. Featured on a variety of 911 models, the all-wheel drive system, officially known as Porsche Traction Management (PTM), first made its street debut on the 1989 Porsche 911 Carrera 4. 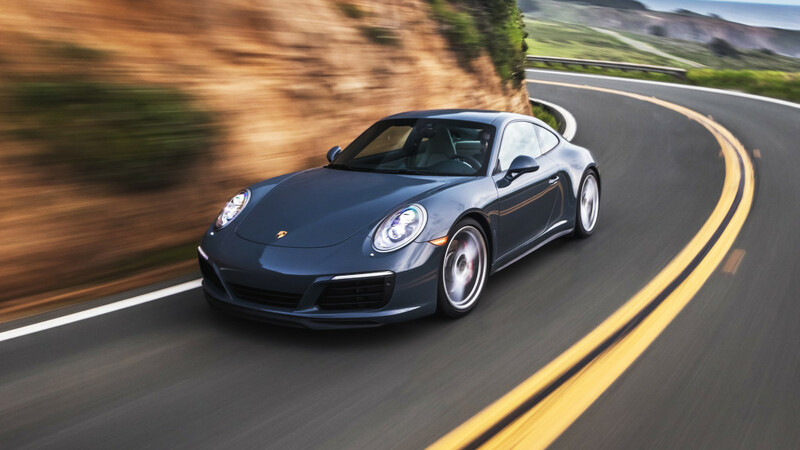 Today, AWD-equipped models of the 911 account for roughly 40 percent of all the sales of the iconic Porsche sports cars, spanning from the $98,000 Porsche 911 Carrera 4 to the $200,000-plus Porsche Turbo S Cabriolet. Porsche Carrera 4S. Courtesy Porsche. That “more approachable” factor takes on entirely different meaning when driving the 420-horsepower 911 Carrera 4S in the canyons of California, and then on the snow-covered Circuit Mecaglisse track in Quebec. In fact, it’s there in Canada, when drifting the Carrera 4S through a series of ice exercises as part of a Porsche Camp4 experience, that one really learns to appreciate the true magic of the 911’s AWD system. Regardless of how slippery the surface is, the Porsche Traction Management system is incredibly responsive in working to quickly get the vehicle back on track. For example, when the system senses that there is oversteer or slippage of the rear wheels on ice, it immediately sends more torque to the front axle, and reduces power to the rear axle, helping the car to pull itself out of the slide. The second the system detects that the car is going into understeer in a slippery situation, you can sense it sending power to the rear axle to reduce slippage. The AWD system’s sensors, working in combination with Porsche Stability Management (PSM), continuously monitor the speed of all four wheels individually to detect slippage and distribute power in the best way possible. The technology is continuously assessing factors like speed, steering angle and weight distribution between the front or rear axle, to decide how to best react to slippage. On a canyon road, the feel for the AWD system’s inner workings are a bit less dramatic than they are on an icy track. But the technology is just as mind-boggling on dry asphalt, upon which it really comes to life when cornering the car through some hairpin turns, high in a California mountain. Of course, the fallout from tire slippage can have far greater repercussions there compared to the simple embarrassment that comes with hitting a snowbank at the test facility in Quebec. Still, there’s this confidence you get in both situations when driving a 911 equipped with PTM, which really entices you to push it to the edge. The most mind-blowing thing about the all-wheel-drive system is that it never leaves you feeling like you’ve compromised the true thrill of a sports car in opting for a Porsche equipped with the safety-inspired technology. “It feels that way because a 911 with Porsche Traction Management is designed to function as a rear-wheel drive car until the very moment when you need power at the front wheels, and it really improves traction and driving dynamics,” explains Achleiter. Then again, as Achleiter points out, the technology in the AWD system in the 911 has always been grounded in Porsche’s racing heritage, dating back to the Type 953, which ran in the 1984 Paris-Dakar Rally. Our Porsche Camp4 instructor, Pierre Des Marais, a seasoned Porsche motorsports driver, was kind enough to gives us a better feel of exactly how far the carmaker’s race-inspired four-wheel traction system has evolved during an adrenaline-rushing hot lap at Circuit Mecaglisse. Looking to push the technology even further, Achleiter says that Porsche is now busily working to find ways to make the next reiteration of the AWD system lighter, quicker and capable of handling even more torque. So, could the idea of a buying a new rear-wheel drive 911 eventually become an anomaly? Well, you’d be hard-pressed to get Achleiter or anyone else from Porsche confirm a future without an authentic rear-wheel drive 911 in their lineup. But it’s clear that the carmaker will continue to press on with Porsche Traction Management, making the idea of an all-wheel drive model of the iconic sports car even more enticing down the road.